2 x 0.5 U.S. fl. oz. During the day, our skin brightening complex is designed to help diminish the appearance of age spots while our firming complex helps provide smoother and firmer looking skin. At night, a PHA exfoliates the skin's surface to revitalize and even skin tone. The serum starts working on day one to soften and smooth skin. In trials, most consumers said they saw a significant improvement in the 3 key signs of aging in 4 weeks. Hypo-allergenic. Kind to even the most sensitive skin. Triple action: Clinically proven to diminish the appearance of age spots. Reduces the appearance of wrinkles, visibly lifts and evens skin tone. Day serum: skin brightening complex helps diminish the appearance of age spots, firming complex helps provide smoother and firmer looking skin. Night serum: a PHA (gluconolactone) increases exfoliation of the skin's surface, helping revitalize and even skin tone. The skin's moisture barrier is also hydrated and replenished. Smooth the day serum into your face every morning. Smooth the night serum into your face every evening. 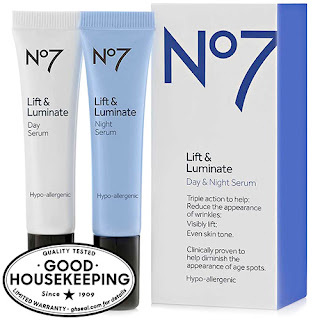 Follow with your favorite No7 day or night cream. Store at room temperature away from direct sunlight.